Outlook Calendar and Google Calendar sync is made easy with Sync2. Synchronize Outlook Calendar folders with Google Account and never miss any important event. Access Outlook Calendar through Google and vice versa. Set up Outlook and Google Calendar sync in a few easy steps. Sync2 can synchronize calendar items automatically at selected time intervals. Or you can start synchronization manually at any time. There is no need to type new event to all calendars separately - once you add a new event, it appears in Outlook and Google Calendar. Sync2 helps you organize your calendars on multiple devices. In a couple of clicks your Google Calendar can be synchronized with Outlook calendars on multiple computers. You can also sync multiple Google Calendars with one or multiple Outlook Calendars. Sync Calendars without duplicates. Sync2 will make sure there are no duplicate calendar events after the sync. Any changes you made offline Sync2 will synchronize as soon as you connect to the Internet again, so nothing will be missed. Sync2 stands out from competitors products because of synchronization flexibility it gives. By creating different synchronization profiles you are able to sync a single Outlook Calendar folder with number of Google Accounts and use different settings for each synchronization. The opposite case is also available - you can sync your Google Calendar with many different Outlook Accounts. Sync Profiles give you complete control of synchronization settings. You can select one-way sync from Google to Outlook with one user, and the opposite direction with another Outlook user. Settings for each profile are edited separately, so it allows setting different sync types (auto or manual), time intervals and filters. Syncing Google Calendar with Outlook Calendar allows you to keep calendars up to date and reach them easily. 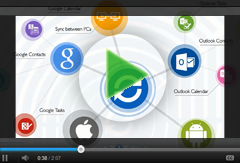 Use Sync2 to sync Google Account with Outlook for Web access. After your Microsoft Outlook Calendar is synchronized with Google, it becomes accessible through the Web. You can even post your Outlook Calendar on the website or blog as an embedded Google calendar. Use Sync2 to share your Outlook Calendar with others on the Internet. When Outlook and Google Calendar are in sync, Outlook Calendar can be reached via Android, iPhone, Windows Phone or other smartphones. As you set up an automatic synchronization in time intervals of your choice, you can completely forget about it. Sync2 will do the job in the background without any pop-up. Sync2 also offers one-way synchronization. It means you can choose to transfer Calendar items from Outlook to Google, or from Google to Outlook only. It gives you an opportunity to transfer calendar items to someone without getting his/her events to your calendar. Some people are concerned about losing their data from one of the sides during synchronization. The one-way sync is a great solution for this matter. The direction of synchronization is selected when creating a sync profile, it cannot be changed later on.